The True Story of the Man Behind the Most Famous Athletic Shoe in History. This new book by Abraham Aamidor is the first biography of Chuck Taylor. Seventy-five years ago these shoes received their special signature ankle patch. Sixty-five years ago these shoes were GI issue to help get American troops fit for service in World War II. Fifty years ago they were the premiere basketball shoe in the country, highly desired by any serious basketball player. Forty years ago, they became avaible in a rainbow of colors, besides the traditional black and white models. Twenty-five years ago they became a “leisure” shoe, more popular for casual wear than for playing basketball. Ten years ago they were nearly abandoned as a flagship product by the Converse company careening toward bankruptcy while still trying to compete with their rivals. Today Converse All Star “Chuck Taylor” shoes are more popular than ever, in all ages and demographics, with greatly increased market share and hundreds of new models manufactured every year. Who was responsible for creating this shoe that has been such an important part of our lifestyle that it has become an American icon? Most people who lace up their high tops each day know very little, if anything, about the real Chuck Taylor, the person whose signature resides on their ankles. Chuck Taylor is a member of the Basketball Hall of Fame, but is he there because of his career as a basketball player and coach, or because he was one of this country’s premiere shoe salesmen? Indiana newspaper writer and Indiana University journalism instructor Abraham Aamidor was one of those people who likes wearing chucks, but didn’t know much about Chuck Taylor. Intrigued by the subject, and the potential to tell a story that needed to be told, Aamidor spent three years researching the life of Chuck Taylor. Much of his work was spent trying to separate legend from reality, hype from the truth. Until this time, there has never been a serious biography written about Taylor, so Aamidor had a lot of work to do without a lot of resources. On the one hand, Chuck Taylor was a private person, partly due to affairs he had with various women, two of whom he married. He had no children or close relatives, and didn’t keep a lot of records. There were only a few people left alive who knew him personally who could be interviewed. (Taylor died in 1969, soon after his induction into the Hall of Fame.) On the other hand, Taylor was a premiere salesman, who could connect quickly with people, and was tireless in promoting his Converse basketball shoe. Taylor spent much of his life on the road, driving around in fancy cars, and staying at hotels, living out of a suitcase. The fact that the most important events of Taylor’s life happened in a time frame of forty to seventy years ago made Aamidor’s task all the more difficult. Among the most interesting parts of the book are the discussions of Chuck’s playing career, his coaching career — especially during war time — and information about some of his greatest innovations, like the basketball clinics that he would provide all over the country, and the Converse Basketball Yearbooks, which are valuable historical documents about the early days of team basketball in America. The book also include a brief history of the Converse company, although this focuses mostly on their business decisions, rather than the history of the shoe production, model design, and marketing. These topics alone could be the subject of an additional book. Chuck Taylor, All Star is an important book for anyone interested in the history of the Chuck Taylor shoe and the life of Chuck Taylor. Mr. Aamidor is to be commended for his invaluable contribution in documenting much of Taylor’s life and his contributions to basketball. Chuck Taylor, All Star by Abraham Aamidor. 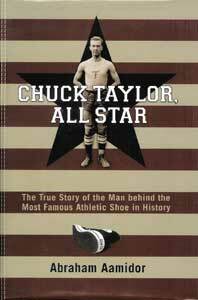 Indiana University Press, 2006, 184 p.
You can order a copy of Chuck Taylor, All Star directly from The ChucksConnection online store and save $4.50 from the retail price. Click here to order.